Bill Traylor, Untitled (Woman with Umbrella), circa 1939-'42, graphite and poster paint on Philip Morris cutout cardboard ad at William Shearburn Gallery's AB/Fig. 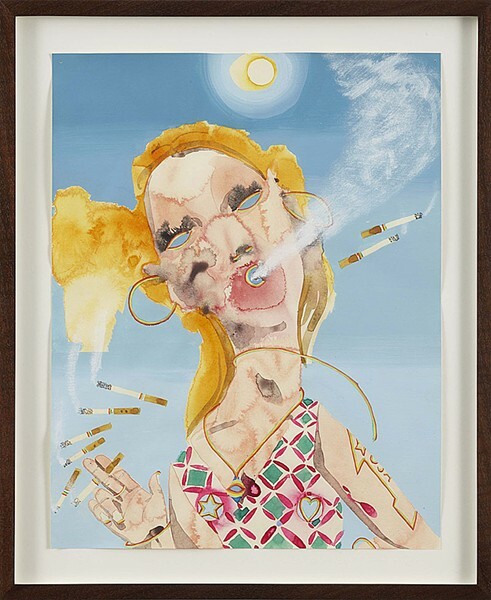 Barnaby Furnas, Girlfriend 1, 2010, watercolor and acrylic on paper. James Rosen: The Artist and the Capable Observer With pieces selected from the artist's six-decade career, this exhibition of oil paintings and ink-on-paper sketches is a double homage: to the art-historical references Rosen draws from, and to the rarefied art of the figure. Focusing on liturgical masterworks of the Italian and Northern Renaissance (altarpieces by Giotto, Grunewald and Duccio, among others), Rosen paints diaphanous canvases that re-present the original compositions — literally — through the gauzy lens of memory. Rosen's modus operandi is a distinct one: He layers each canvas in nearly 60 "veils" of oil paint and wax, in successively less intense gradations of pigment, resulting in a ghostlike image of almost watery depth, where the more extreme hues surface and hint at the otherwise submerged imagery. The result is a work that straddles abstraction and realism: Given patient scrutiny, the nearly opaque gray surface reticently conveys a fully realized figural work. Several collections of works on paper accompany the paintings, illustrating Rosen's dedication to drawing as a means of homing in on his subjects. In their linear delicacy, these small studies may equal the impact of the completed works; here the dynamic of the paintings is reversed, as Rosen reveals himself to be a near supplicant to the faces, bodies, landscapes and shadowy details of the things he trains his eyes on. Through December 12 at the Museum of Contemporary Religious Art, 3700 West Pine Boulevard (on the Saint Louis University campus); 314-977-7170 or http://mocra.slu.edu. Hours: 11 a.m.-4 p.m. Tue.-Sun. Remembering Teddy An intimate reflection on an important friendship, this collection of photographs, needlepoint, cards and assorted other artifacts fondly exchanged and saved between two people is not merely a homage to Carla "Teddy" Trova, who died in 2008, but to the creative dimension of gift-giving. 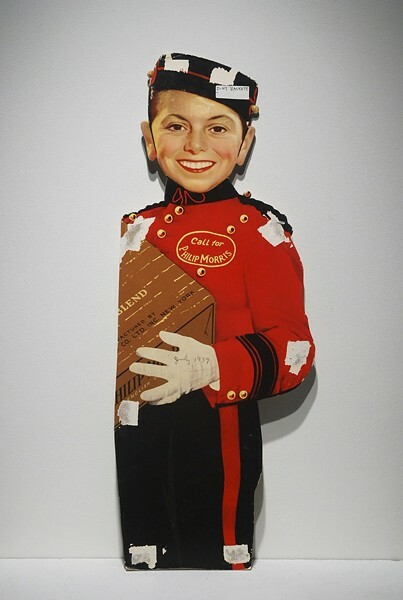 Assembled by local gallerist Jim Schmidt, the work included pays tribute to the wife of the late artist Ernest Trova, whom Schmidt befriended in the late 1960s, when he was employed as the sculptor's assistant. Teddy (as she was known as) taught Schmidt the art of needlepoint, along with, it seems, the other arts of living — cooking, greeting-card making and unconditional encouragement. What emerges is a portrait of two previously unsung talents: Teddy, it is clear, was a gifted collagist, deploying film stock from her casual practice as a photographer as a core material; and Schmidt reveals himself to be an inspired needlepoint maker whose work is both abstract and illustrative (enlarging panels of Buster Brown comics, which he collected). One of the most moving elements of the exhibit is a room dedicated to Schmidt's black-and-white photographs, which he developed, affixed to matte board and assembled in a box as a gift for Teddy. The imagery is largely composed of portraits of his former high school students (Schmidt, a native East St. Louisan, was an English teacher there for five years) and is accompanied by song lyrics by Bob Dylan, Jim Croce and other '60s-era singer-songwriters. The radiance of these portraits is almost shocking — the young people shine with a modest joy for life that can only be captured unself-consciously, by a friend or peer. Their fundamental artlessness encapsulates the tenor of this unique and moving exhibition of all that is impossible to commodify. Through January 8, 2011, at PSTL Gallery, 3842 Washington Boulevard; 314-531-4304 or www.paceframing.com. Hours: 10:30 a.m.-5 p.m. Tue.-Sat.